Hosting a breakfast bridal shower is a great idea for a bridal shower that will be followed by an evening bachelorette party. A bridal shower is typically attended by mothers, aunts, grandmas, etc. that wouldn’t be participating in evening bachelorette festivities. By hosting a late-morning bridal shower, you have the opportunity to enjoy a relaxing shower with your closest friends and family members while still saving yourself enough time to enjoy an afternoon at the spa with your best girlfriends before a night out on the town. 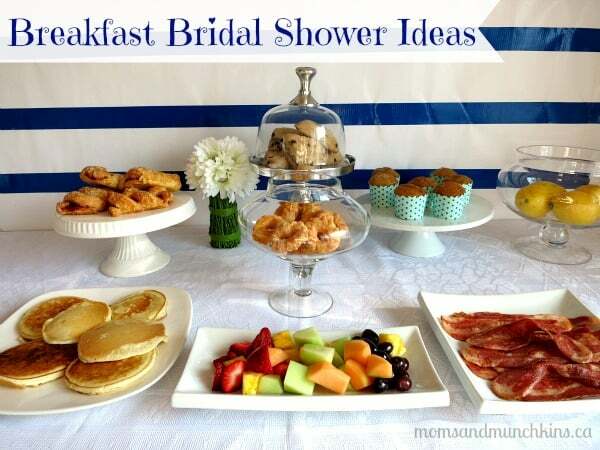 In this post I’ll share some menu ideas for a breakfast shower. The display for a breakfast bridal shower can be simply white dishes on white linen dressed up by a few spring accent colors like yellow daisies, lemons and pink tulips. A variety of easy to prepare foods can be served on pretty serving trays, cake pedestals and in candy vases. For more recipe ideas, you can visit our Recipe page. For more Bridal Shower ideas, visit our section dedicated to bridal showers. For sweet & exclusive bridal shower favors, visit Beau-coup (a Moms & Munchkins affiliate link). We’re always adding new ideas so be sure to follow us on Facebook, Twitter, Pinterest and Bloglovin’. So pretty! And with Mimosa!